Having successfully conquered a fashion competition in their high school, the ghouls of Monster High™ are on their way to invade the world’s fashion capital - Scaris, the City of Frights™. Making a pit stop here in Malaysia, the ghouls - Frankie Stein™, daughter of world-famous monster Frankenstein; Clawdeen Wolf™, daughter of the Werewolf; Draculaura™, daughter of Dracula; Ghoulia Yelps™, daughter of the Zombies; Cleo de NileTM daughter of the Mummy and Lagoona Blue™, daughter of the Sea Monster – made their scary-cute appearance at the Mid Valley Fashion Week on Friday 12 April to officially launch the Monster High™ clothing collection in Malaysia. The totally-clawsome bunch stepped out in their drop dead gorgeous, trendy and sophisticated attires; pleasing Monster High™ fans with their little quirks, flaws and imperfections- all of which reflects their monster heritage. Their appearance was then followed by a mini-catwalk fashion show that included young models parading the new collection, which is targeted to children aged between 6 to 13 years old. 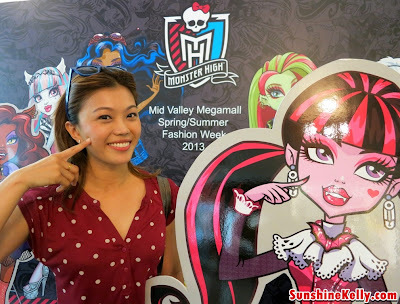 The clothing line which will be available at all major departmental stores, will also be complemented with an exciting range of footwear, bags, stationary, arts and craft items, home wares as well as their very own Monster High™ magazine. An official ‘Meet and Greet Session’ was held outside the Toys R’ Us store in Mid Valley Shopping Centre where a large crowd of fans queued to get a picture with their quirky idols. 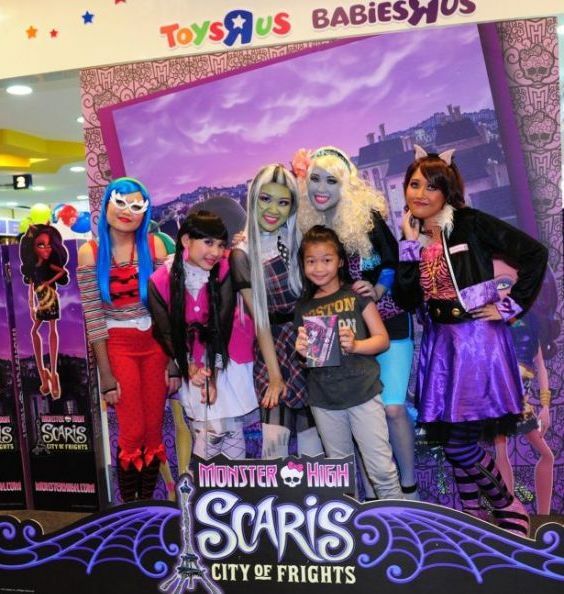 Frankie Stein™, Clawdeen Wolf™, Draculaura™, Ghoulia Yelps™ and Lagoona Blue™ are all characters in Mattel’s first 2013 Monster High™ TV Special titled “Scaris: City of Frights” which also includes Rochelle Goyle™ and two new Monster High™ characters, Skelita Calaveras™ and Jinafire Long™. The TV special tells the tale of ghouls’ fangtastic adventure of a lifetime in Scaris, City of Frights™– the city where screams really do come true! When Clawdeen Wolf™ gets a chance to apprentice for legendary fashion designer Madame Ghostier, her best ghoul-friends and her pack their bags and hop on a plane for their very first trip abroad together. There, she meets her worthy opponents, Skelita and Jinafire, while her friends, Frankie and Rochelle uncover clues to a spooktacular secret hidden deep beneath the cobblestone streets. fangtastic Thanks for sharing, Your blog is perfect, and I like this article. I find the information I need. I think I can find more useful information here, thanks.